23 million Americans remain unemployed, underemployed, or have left the workforce discouraged. Even worse, Washington policymakers seem out of ideas. 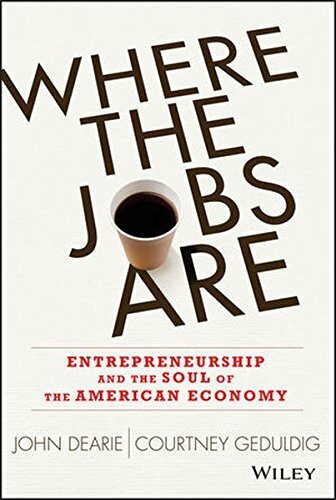 Where the Jobs Are: Entrepreneurship and the Soul of the American Economy shows how America can restore its great job-creation machine. Recent research has demonstrated that virtually all net new job creation in the United States over the past thirty years has come from businesses less than a year old—true "start-ups." Start-up businesses create an average of three million new jobs each year, while existing businesses of any size or age shed a net average of about one million jobs annually. Unfortunately, the vital signs of America's job-creating entrepreneurial economy are flashing red alert. After remaining remarkably consistent for decades, the rate of new business formation has declined significant in recent years, and the number of new jobs created by new firms is also falling. In Where the Jobs Are, the authors recount the findings of a remarkable summer they spent traveling the country to meet and conduct roundtables with entrepreneurs in a dozen cities. More than 200 entrepreneurs participated—explaining in specific and vividly personal terms the issues, frustrations, and obstacles that are undermining their efforts to launch new businesses, expand existing young firms, and create jobs. Those obstacles include a dangerously underperforming education system, self-defeating immigration policies that thwart the attraction and retention of the world's best talent, access to capital difficulties, a mounting regulatory burden, unnecessary tax complexity, and severe Washington-produced economic uncertainty. Explains how start-ups are different from existing businesses, large or small, and why they represent the engine of job creation Reveals how policymakers' failure to understand the unique nature and needs of start-ups has undermined efforts to stimulate the economy following the Great Recession Presents a detailed, innovative, and uniquely credible 30-point policy agenda based on what America's job creators said they urgently need Engaging and informative, Where the Jobs Are reveals with unprecedented precision and clarity the major obstacles undermining the fragile economic recovery, and provides a vitally important game plan to unleash the job-creating capacity of the entrepreneurial economy and put a beleaguered nation back to work.